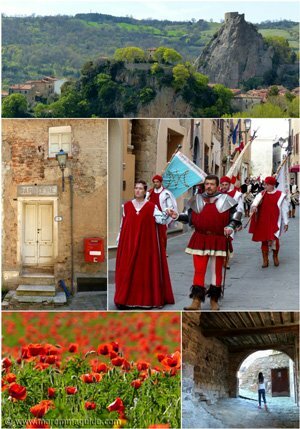 Maremma Castles, Forts & Towers in Tuscany all for exploring! 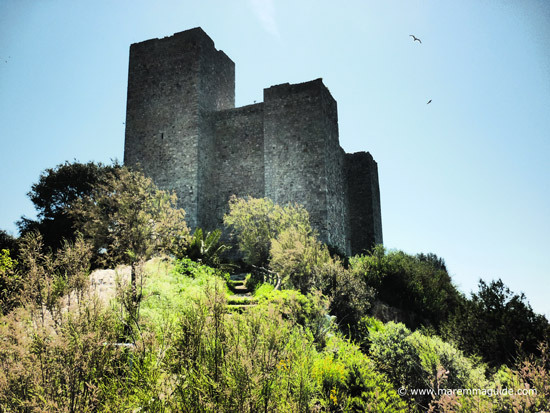 Maremma castles, fortresses and towers: hundreds of them all for the exploring. 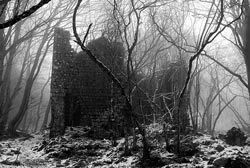 From those well preserved and still occupied today to ruins on strategic hill tops deep within thick oak, beech and chestnut forests. Inland citadels built to retain control over the mines and mineral transportation routes through rich metalliferous hills. 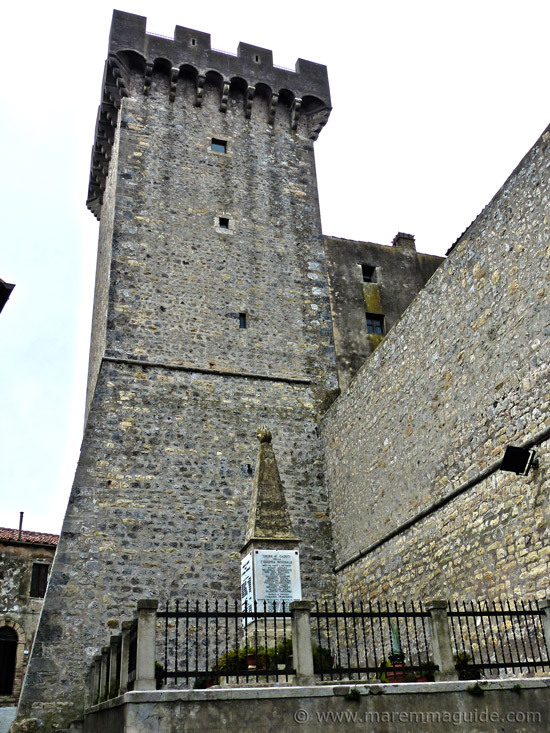 Fortified "le Rocce" that belonged to ruling medieval nobility, which throughout their tempestuous history frequently and bloodily changed hands and as they did were demolished, re-built, and extended with walls thicker than the length of your arm and impregnable towers. And Spanish occupation that brought with it new architecture and - even today - changed the local language along coastal Maremma. 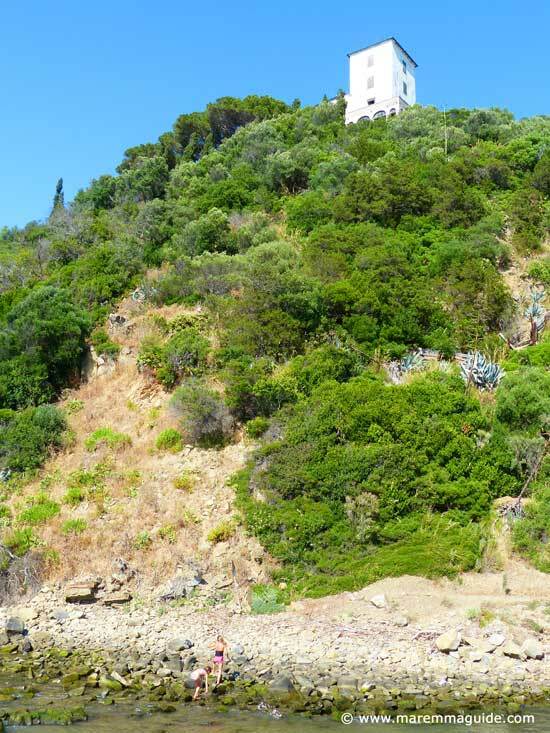 And then there is Maremma's long chain of coastal forts and look-out towers built at a time when devastating Barbary and Saracen pirate raids were a common experience. Whole villages and towns would be ransacked and the occupants either killed, or captured and transported to a life of slavery. 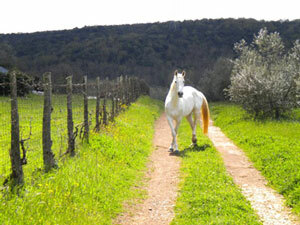 Maremma is a heaven for lovers of medieval history. 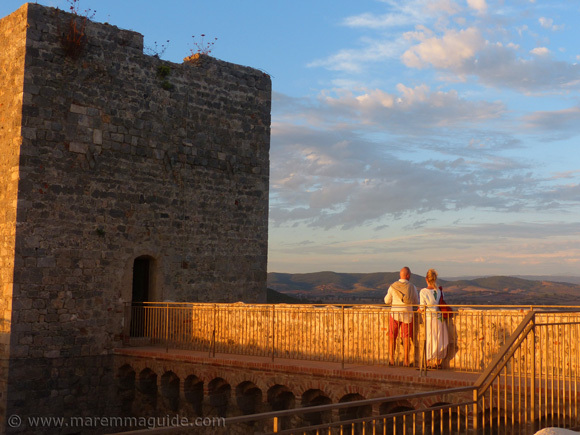 Many of Maremma's medieval castles are still "living castles". 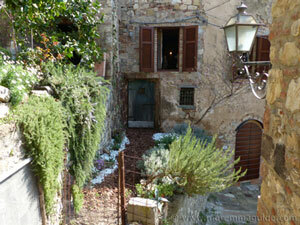 Forming the - often round - historic centres of Maremma's myriad of medieval hill top hamlets, villages and towns. Narrow medieval streets full of tiny homes, with tiny doors, one on top of the other. Others are ruins that require a trek through thick woodland and Mediterranean macchia plus a good dose of faith that you won't get lost along the way, to reach them. 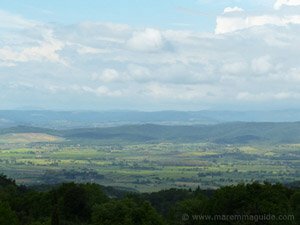 Histories that tell of bloody battles, sieges, and changes of fortune of their occupants - for they were built to hold power over and control Maremma's mineral rich hills and mines. Between the power plays of the Bishops of Volterra, the competing ruling noble - and less than noble - families of Maremma, the cities of Firenze, Pisa and Siena, as well as the Pope. 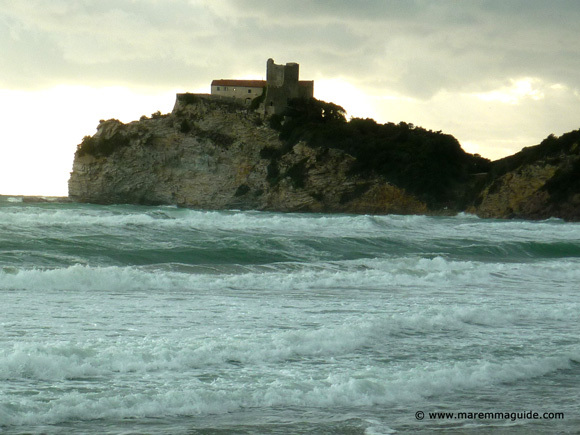 Life in Maremma when her middle ages castles were built and lived in was dangerously Machiavellian. And the walls and those castle, fortress and tower stones hold the tales and stories of it all. Some have been dug over by archaeologists from Siena and Firenze Universities and their treasures - in some cases hoards of gold coins as untouched as the day they were minted - placed in those cities museums. 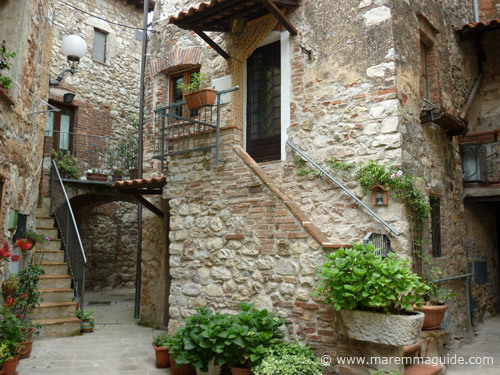 But some of the treasures remain here in Maremma's small rural museums waiting to be discovered by you when you least expect it in a quiet village or town. 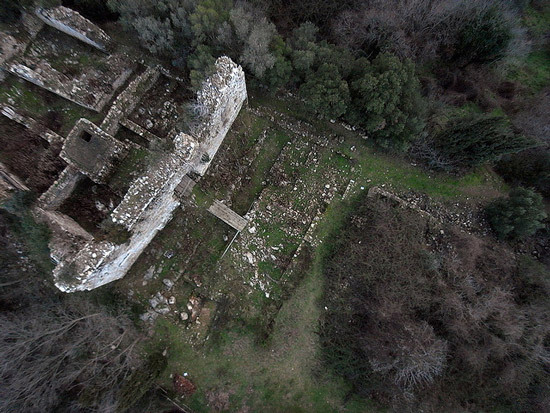 And if that wasn't enough history, nearly all of Maremma's castles were built on pre-existing Etruscan foundations or rest on buried Etruscan settlements. Some are castles you can get married in - in one the open air! Simply unforgettable settings for a wedding that no one, not just the bride and groom, will ever forget. 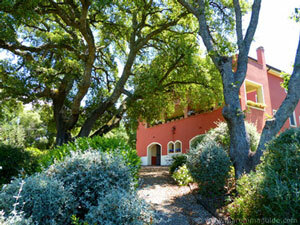 Others are now in private hands: rare and unique homes with incredible panoramic views. 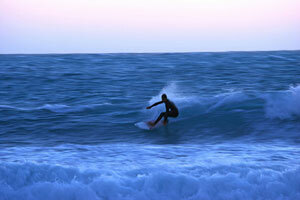 Some of which available as vacation rentals. 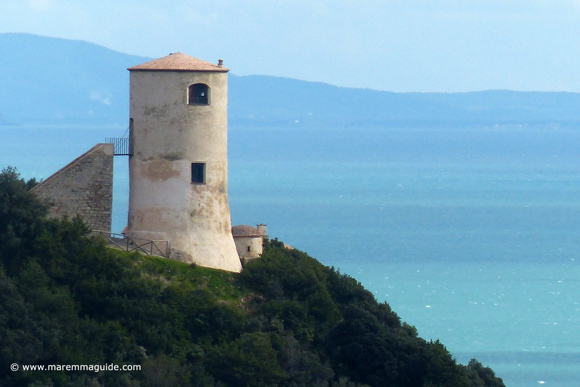 Especially the forts and medieval look-out towers along Maremma's coastline, where they once formed a defensive chain. Locations with a WOW factor. Definitely for the dreamers and romantics amongst you and nothing like the Tuscany coffee-book villas you were planning on staying in! And some are very patiently waiting for someone with huge pockets full of money and trusting, experienced hands to purchase and restore them to their former glory. Sadly crumbling every year until they become beyond rescue. 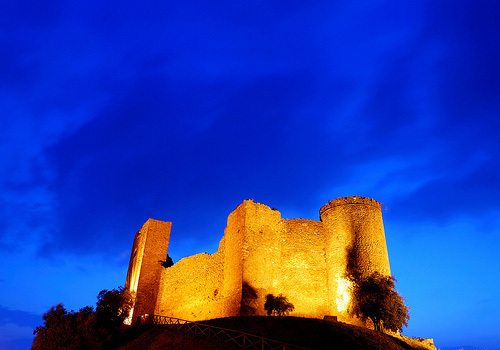 Instead of "castello" (castle), Maremma's medieval forts are most frequently known as "la Rocca" or "fortezza" and you will find the words "fortificazione", "forte", or "fortino" in the information written about them. "Fortezza" and "fortificazione" are the Italian for fortress and fortification, respectively. And "forte" and "fortino" are the Italian words for "strong" and "blockhouse" (a single building isolated fort), used when referring to defensive strong holdings with inferior dimensions to those of either a fortezza or fortificazione. 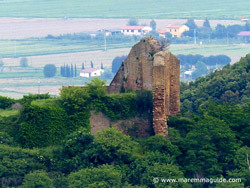 But it is the term "Rocca" or "roccaforte" meaning fortress or stronghold that you will see more often used in Maremma. 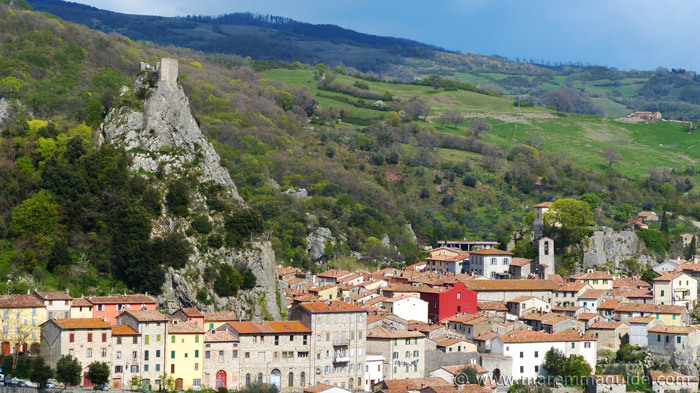 Although the word "rocca" literally translates as "rock" in the English language, in Italian it refers to a fortified building built on a high and steep position, often with a medieval "borgo" - village or hamlet - below and around it. 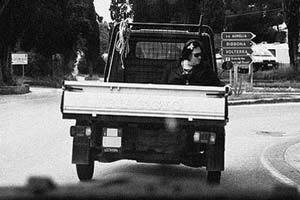 It is for this reason that many Italian town names begin with "Rocca..." . This virtually impregnable middle ages fortress was built on the summit of the cliff that dominates the town of Roccalbegna below. Designed as a refuge in the event of a siege by enemy troops, whoever owned it - and many tried to - controlled one of the principal highways through Maremma. 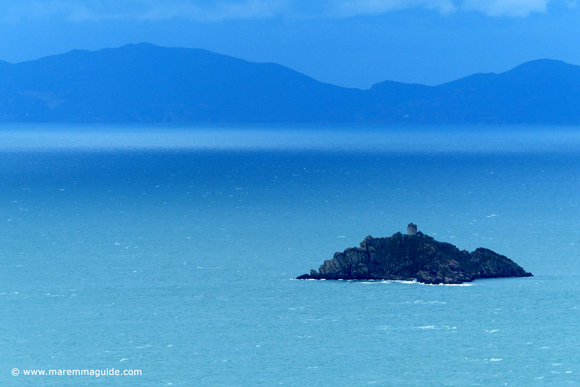 Climb to the top for a nothing less than stupendous view and a surprise on the way up! Places in which to play "I'm the king of the castle..." don't come much more atmospheric than the "La Rocca Aldobrandesca di Roccalbegna". 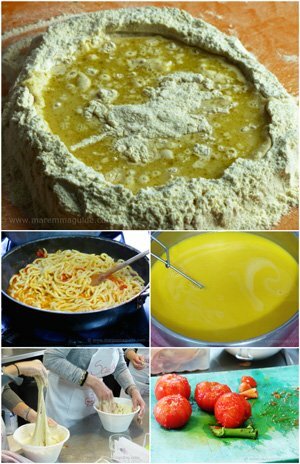 Your kids will love it. 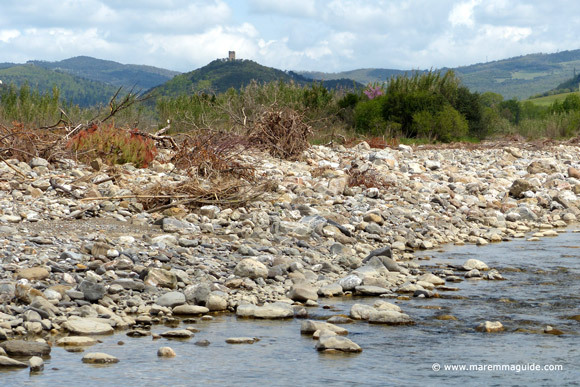 There are twenty-eight in Maremma and they are distinguishable by the fact that, rather than being isolated castles, they were more usually urban ones: built on the highest point in the centre of a hill top village or town. Often as not with the underlying bedrock protruding into their rooms, they were surrounded by a wall that contained a main master palace, a defensive or look-out tower, and other buildings all inter-connected by alleyways. 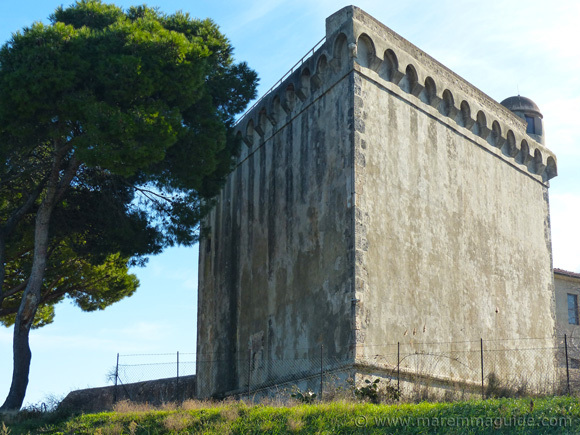 Maremma is home to many of these citadels - "citadel fortificae" - both inland within her metalliferous hills, built to control the gold, silver, iron & cinnabar mining activities in the area and the main trade route roads between Pisa, Siena and Florence. And along her extensive coastline, built as defence against military attacks from both the French and Spanish, as well as many raids by Barbary pirates. Whether they were originally built as a ruling medieval families defensive position, or as a military fortress with a Garrison of soldiers stationed under the command of a city's captain, many "le Rocce" were later further expanded and developed into "castelli" (castles) and residences for noble families. 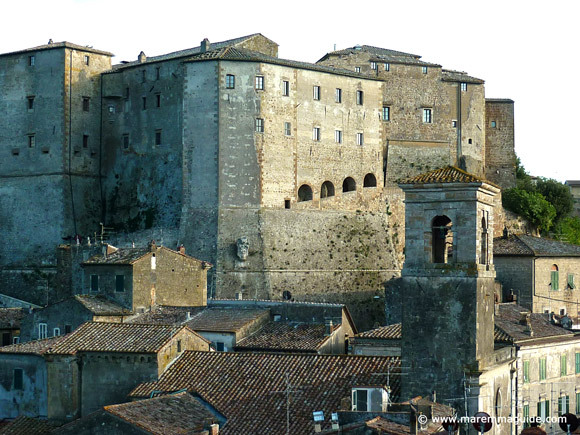 Some of Maremma's most imposing medieval fortresses - such as the magnificent Fortezza Orsini in Sorano - have their castles enclosed in the middle of them. 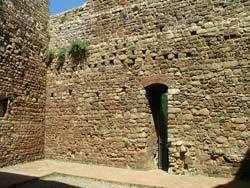 Maremma's castles and forts can sometimes be known locally with interchangeable names. Representing who originally built them - eg Rocca Pisana and Rocca Aldobrandesca meaning that both the city of Pisa and the noble medieval family of Aldobrandeschi owned them. 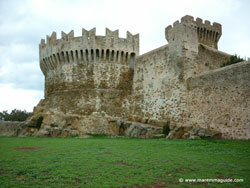 And as "castelli" and "fortezzi" - castles and fortresses, respectively. 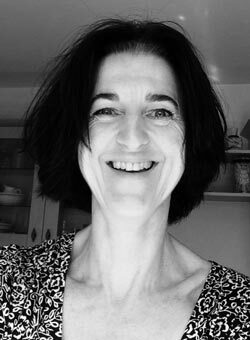 So I gave-up trying to be English and precise about listing them here as either one or the other, and have taken an Italian-style attitude to the categorisation and in a really relaxed and fluid way have mixed them together! After all, on the ground on a day out exploring it makes no difference at all! 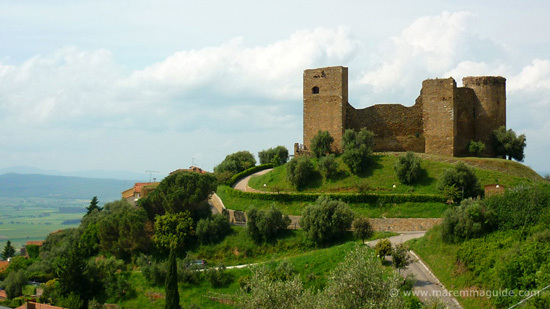 These are the forts and castles in Maremma that you can visit, together with the history of those that you can't explore but that you will see on the horizon as you travel around Maremma. You might not be able to get inside the latter, but they have incredible stories to tell nonetheless that I could not leave them out. It is of my daughter's pterodactyl that goes with us everywhere: so if he has been there you can too! At some of the castles exploring them means just around the outside as the internal structure is closed, but my page with the information will let you know what you can see. 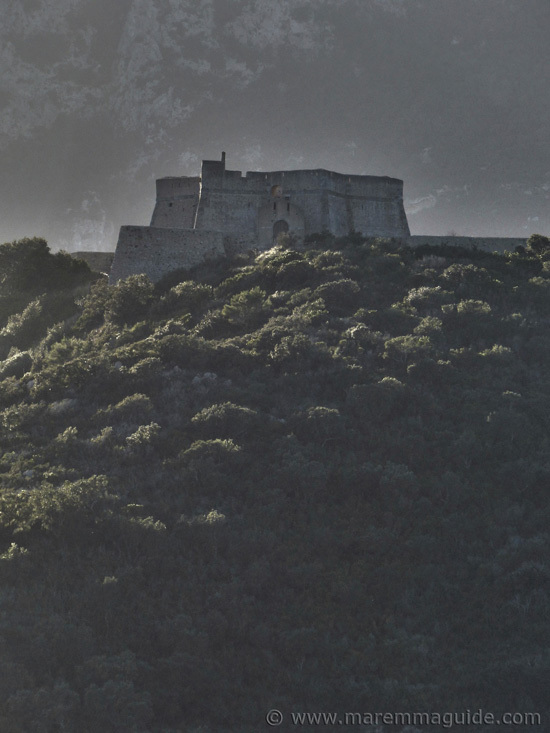 Also known as the Castello di Buriano, the Rocca Aldobrandesca di Buriano is visible from the hillside of Vetulonia, and from there there appears little to see of interest. 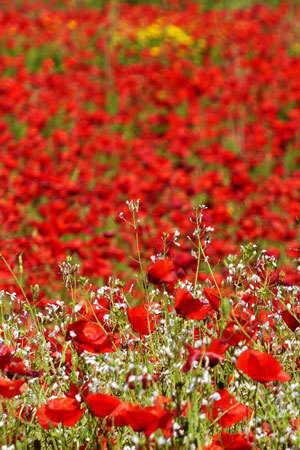 But visit you should for the sheer silence and incredible view. The Castelluccio di Cornia is one of Maremma's crumbling castles that at first you will be forgiven for thinking is "just a tower", for the little that is left all of its castle walls are well and truly hidden from view from the trees covering the hill upon which it sits. Local enthusiasts are trying to rally assistance to preserve it and have cleared the castle grounds of woodland and it access paths, but if you want to see this one before it is too late I suggest that you visit sooner rather than later. 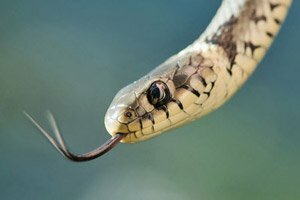 The road to reach it is an adventure in itself anyway and will take you over smelly ground and past a huge, long, hot snake! In a strategically high and beautiful location in Maremma Livornese, La Rocca di Campiglia Marittima was home to an important medieval aristocratic family of Della Gherardesca. These "Conti di Campiglia" - Counts of Campiglia - employed the talents of specialized master builders from Pisa and built an impressive residence with extensive fortress walls with bastions, towers, a palace, castle keep and internal cistern. 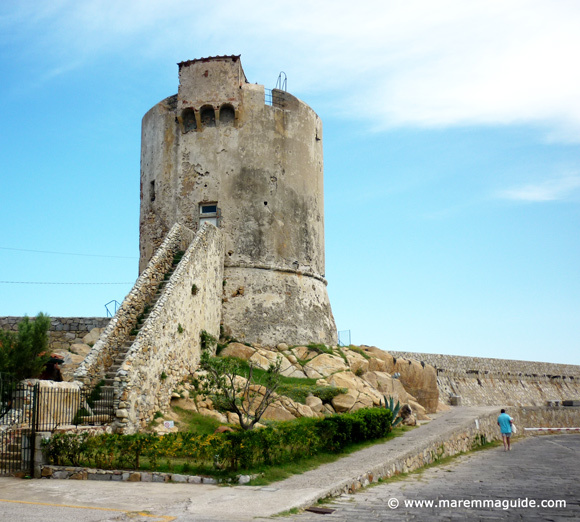 The Rocca Aldobrandesca in Capalbio: kids will love its tower but mum might tremble! 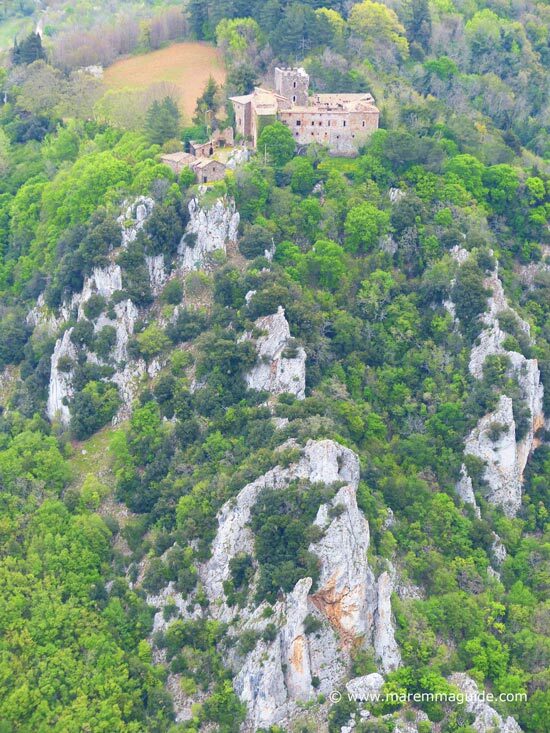 Castello di Fosini is perched on limestone cliffs within the "Reserva Naturale Cornate e Fosini" - home to rare endemic fauna and flora and the silver mines of Poggio Mutti. From the first recorded ownership of the castle by the Bishop of Volterra, and thence upon his death to the Bishop Hildebrand de Pannocchieschi, it changed hands between feudal families many times. And it is haunted. The ruins of Castello di Montemassi are perfect for exploring with children (try finding all of the red letters of the Italian alphabet that mark the archaeological reference points on the site) all the while surrounded by a stunning Tuscany landscape that will take your breath away. 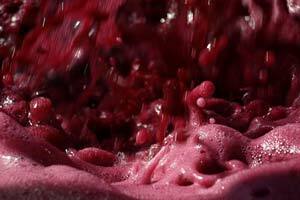 It was once the home of the great and rich Salimbeni family of Siena whose perpetual war of vengeance with Siena's other great noble family, the Tolomei, left that city's streets covered in blood. 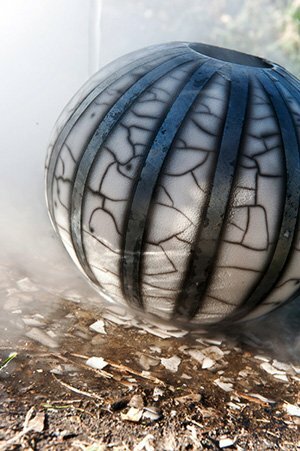 Photo by kind courtesy of Kaoscube. 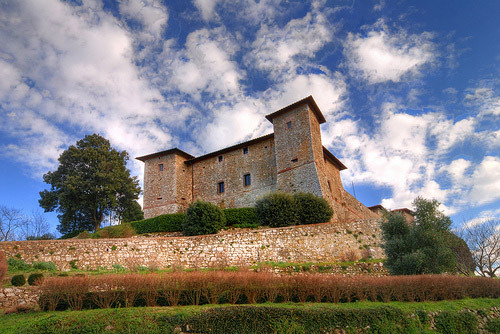 The stunning Castello di Montepò is situated in countryside north of Scansano. Its original fortified structure was built in the year 1000 close to an old a church, but in the middle fourteenth century, under the rule of the "Signore di Cotone" - Lords of Cotone, it was rebuilt. 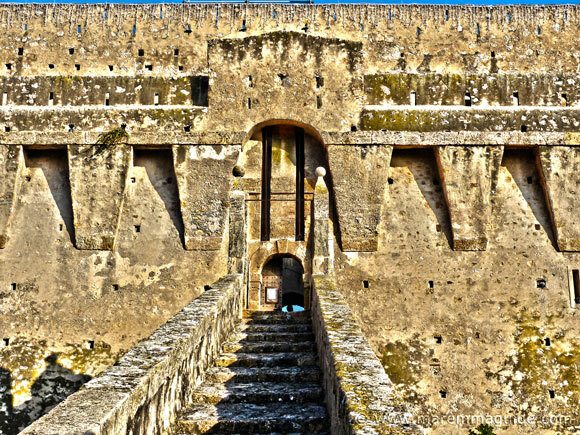 Both Sorano and its impregnable fortress - the Fortezza Orsini - are places in Maremma that you must see. Must. The fort is a maze of rooms over five levels and a guided tour - the only way to see inside - will take you along subterranean walkways fifteen metres below ground. It is home to secret spiral staircases and walls painted with Renaissance frescoes and a unique 16th century musical score, which hold the truth about violent Niccolo IV Orsini. 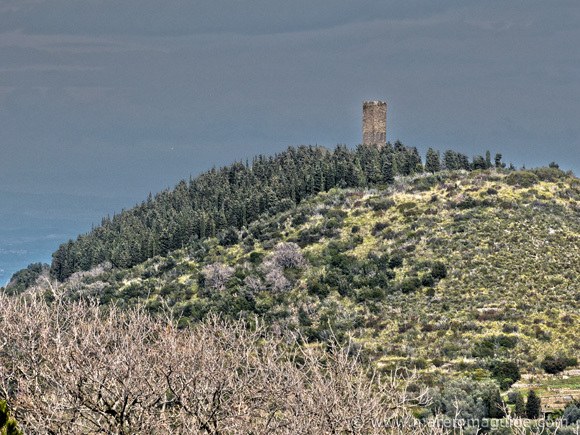 Built on a strategic high point in the southern metalliferous hills of Maremma Grossetana to guarantee the control of mining activities near Massa Marittima it is, however, for the legend of the Lady Pia de Tolomei that Castel di Pietra is renowned and with which it will forever be entwined. But find it if you can! 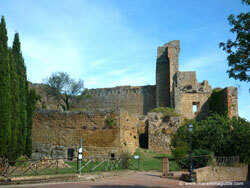 Castello di Piombino juts out into the sea and marks the south-east limits of the city of Piombino. 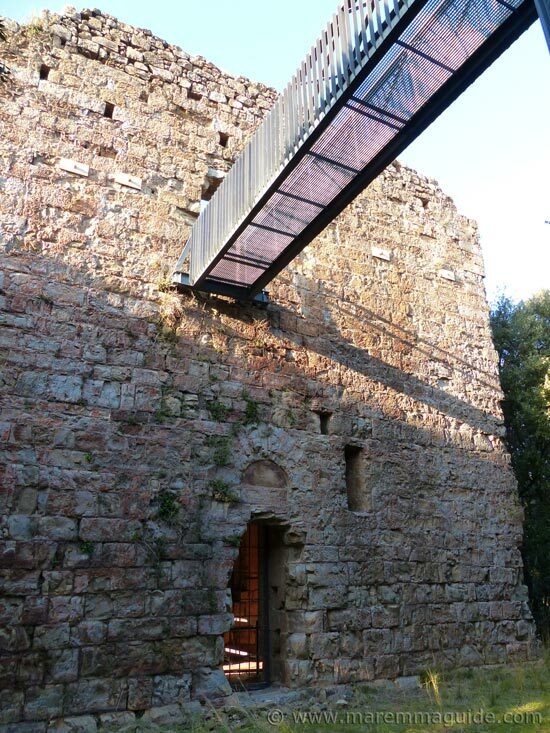 It was originally built by the City of Pisa in the thirteenth century and known then as "Cassero Pisano". Then, in the five years between 1552 and 1557, Cosimo I de Medici expanded it with a star shaped fortress - the "Fortezza Medicea" - which you can walk around today. 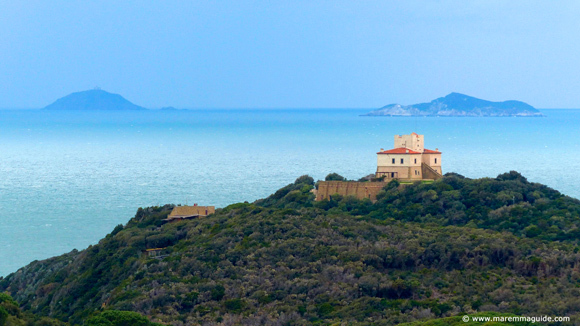 You will need to pay a small fee to enter this fortress and climb its tower, but the Rocca di Populonia or the Rocca degli Appiani has a fantastic view of the Costa degli Etruschi and even very young children can manage the steps. Its round and tiny and if you didn't know it was there you would miss it, but this atmospheric Tuscany castle is as much lived in today as it was in the Dark Ages - albeit without the stenches and other such nasties - and has its own legend. The Castello di Ravi. 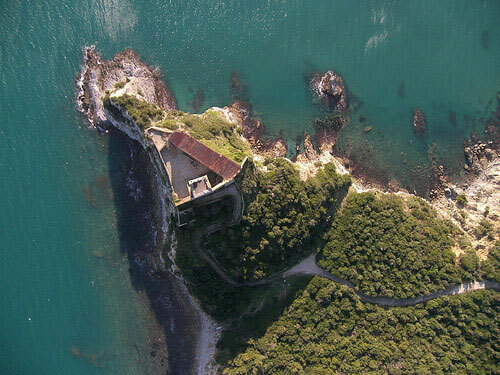 Situated on a promontory between Castiglione della Pescaia and Punta Ala, Forte delle Rocchette is a landmark along this part of that cannot be missed if you are sat on one of Castiglione della Pescaia's lovely beaches. 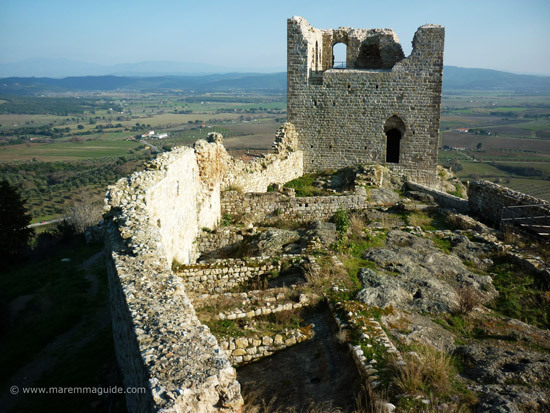 What began as a lookout tower and church in the 12th century - when it was known as "Rocca de Campo Register" - became a polygonal fort when it was later heavily reinforced with curtain walls. The first Castello di Sassoforte was constructed by the end of the 11th century and belonged to the influential medieval Aldobrandeschi family who didn't want to stay there any longer and so leased it to their vassals until the first half of the 14th century. One of Maremma's imposing middle ages castles and one of my very favourite places to visit to just sit and stare at its incredible view. The tiny outdoor bar in the summer is my home from home office! It sits on the site of a Bronze age village with the rare combination of three different angular and round corner towers, and five irregular sides. 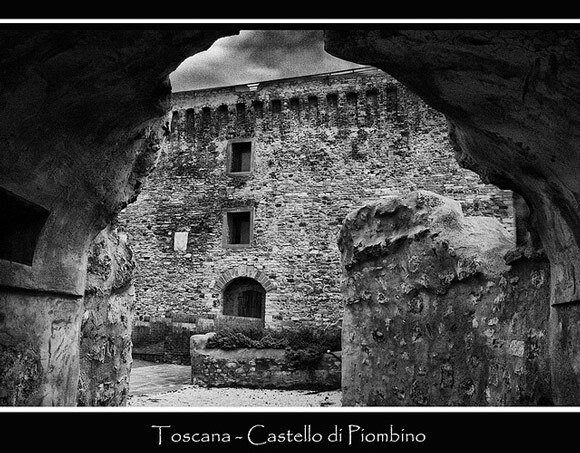 Start with this page Il Castello di Scarlino and then this for even more history - "La Rocca Pisana". The archaeological excavations by Siena University revealed an ancient church in which a hidden hoard of a hundred 14th century gold coins were discovered... La Pieve di Santa Maria ancient middle ages church. 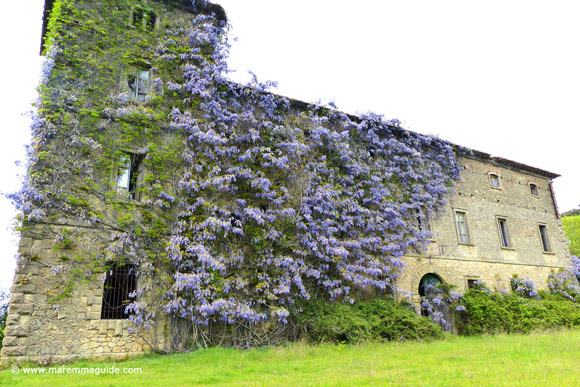 You can walk in the small grounds of Sovana's castle, but not inside. Not a lot to see, but it completes a visit to this tiny tourist spot packed with history in Maremma. On the original site of a village of huts, first a defensive stone tower and then a large trapezoid structure were built and occupied by the prestigious Aldobrandeschi family, until the demise of their rule and occupation of the fort by a Pisan garrison. 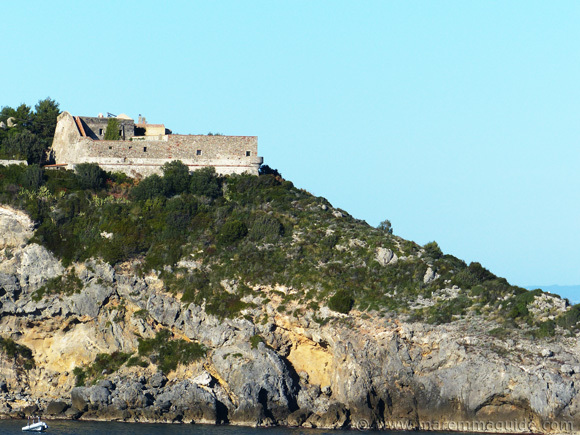 Scare the living daylights out of your tiny pirates when you climb to the top of Talamone's fortress and tell them about Saturday the 10th June 1544. And/or sweep your girl off her feet if you are still there at sunset. The Rocca Aldobrandesca di Talamone. 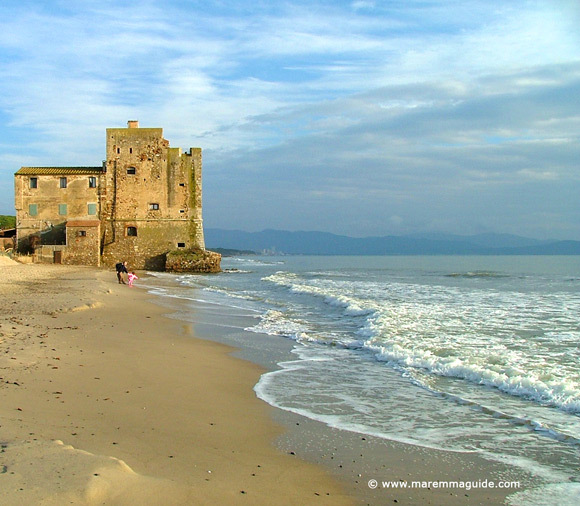 Maremma has a lot of coastal defence and look-out towers: if you had lived along this coastline from the middle ages into the seventeenth century and experienced the pirate attacks that villagers by the sea did, you would build a tower or two too! 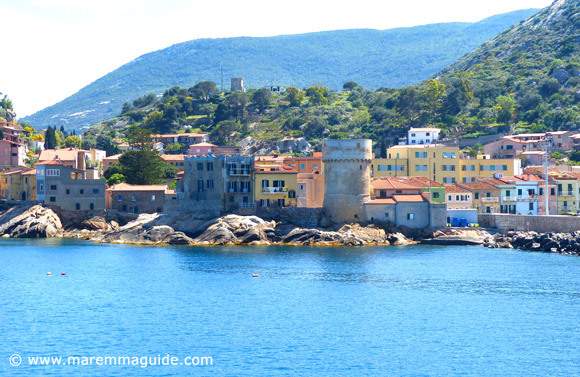 The Torre del Saraceno in the Giglio Porto on the Island of Giglio. The first of the towers were built during the ninth and tenth centuries by the then rulers of Maremma; the cities of Pisa and Siena, and the Aldobrandeschi family. Then in the sixteenth century more were added by the then ruling powers of the Principato di Piombino, the Grand Duchy of Tuscany and the municipalities of Orbetello and Monte Argentario. In the second half of the sixteenth century the Spanish occupying Maremma under the Stato dei Presidi - from Talamone down into the Papal States, the Isola di Giannutri, and part of the Isola d'Elba - significantly upped the ante with an impressive coastal defense system in their own style. Existing towers and forts were upgraded and new, huge and distinctive star-shaped fortresses built. 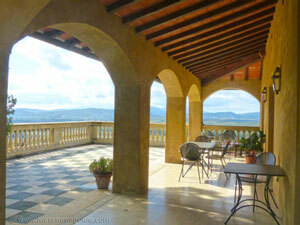 Torre Civette is a private home, currently being restored and oh, how I wish it was mine! 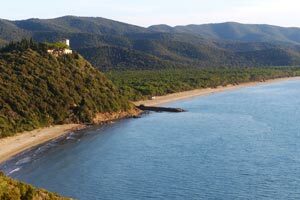 For its views of sunsets over the Isola d"Elba are stunning and the seriously long and wide sandy beach of Capanna Civinini that it guards is one of my very favourite in Maremma. Some you just have to climb for the views will blow you away and, if you are at all like me, the adrenalin pumping through your heart as you climb their near vertical steps or ladders to reach the top will give you sweaty palms and make your heart beat so fast that even a double espresso couldn't match! This one - called the Candlestick Tower in English - is in my home town of Massa Marittima and is not to be missed. Connected to a Sienese fortress by an impressive arch, the views are spectacular. Don't forget to take your camera! You will need to walk at least a kilometre up hill to reach it and then a kilometre back, and there isn't much left but four crumbling stone walls. There is a "tardis" staircase you have to climb that will make mum feel wobbly! A panaoramic view under blue skies and stars. And, two mysteries that remain unsolved. 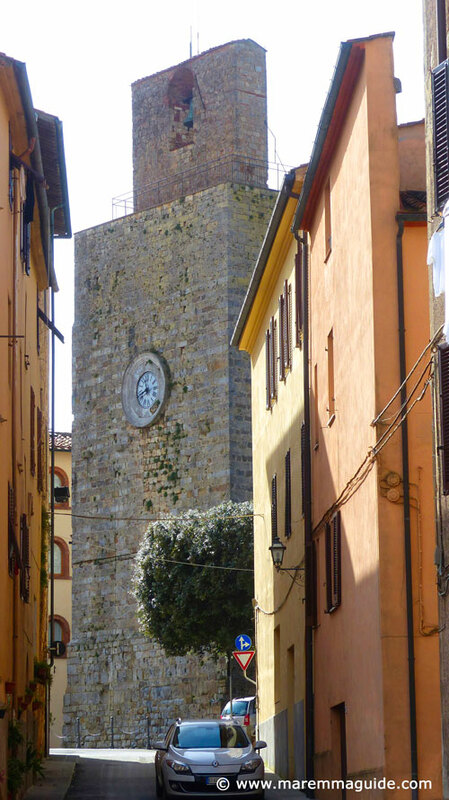 The Torre dell'Orologio once formed part of the castle of Pereta, a hill town in a strategic position just south of Scansano. It is the tallest of Maremma's surviving towers - standing at 29 feet high. 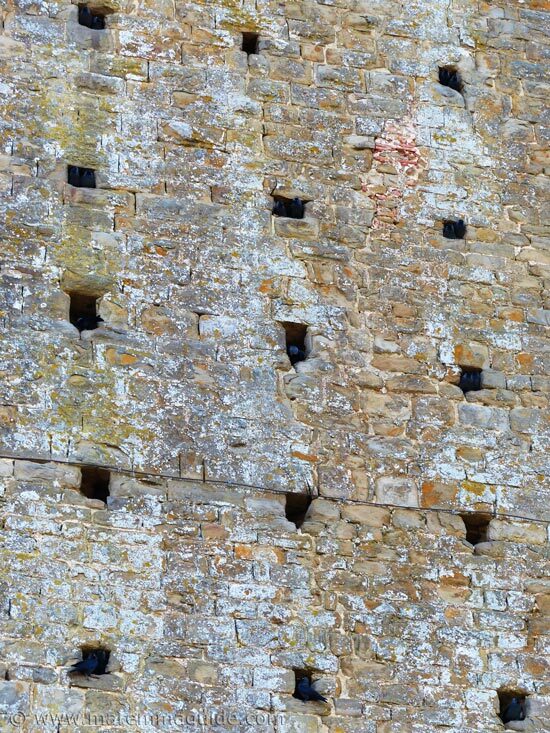 This is just part of one of its walls: each of the scaffolding holes that would, in the fourteenth century, have connected this medieval tower to another structure and the church below, is now home to a pair of nesting black rooks. It is closed at the moment for restoration - you can see its scaffolding from miles around. But when it re-opens I'll let you know. 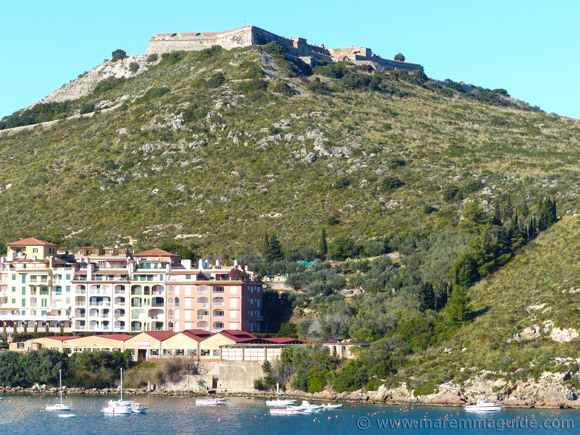 This is the stunning Spanish fortress, La Rocca Spagnola in Porto Ercole. 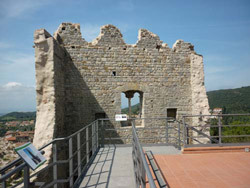 Once the medieval Rocca Aldobrandesca, it was reinforced and extended by the Spanish in the 16th century. The kite aerial photograph is by kind permission of Opaxir. 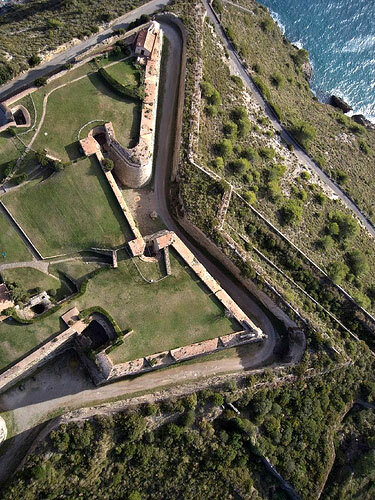 Forte Stella, the stunning star-shaped Spanish fortress in Porto Ercole. Built for one reason. And one reason only. To give you two days to prepare to repel an attack. Or run. Before they came to enslave you. 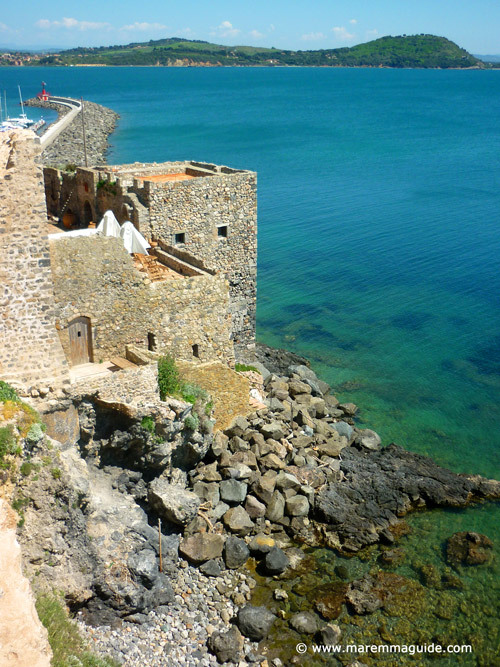 The Torre do Cala Galera - the tower of Galera cove - has a spectacular coastal and seascape view and an internal jacuzzi! This is the place to take a girl to that she will love you forever for! And this one is a sixteenth century fortress - in a great location in Maremma - that has a private terrace to die for and its own rocky cove. Check availability. 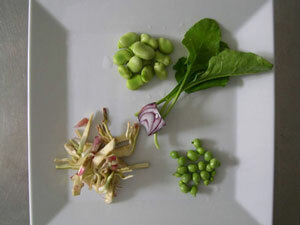 Find out more in my Maremma self-catering with a difference page. You will need deep pockets to restore it as the roof has already gone in places... To find out more, pop on over to my real estate page and send me a message.